We had this 3’ pile of snow outside our front door that had been there since mid-January. In March, it started melting little by little and last Tuesday it was about 70 degrees and it finally went away completely! If you’re thinking that’s a great reason to make a cute little spring dress and photograph it outside, you don’t know the mountains of CO! The very next day we got 8” of fresh snow dumped on us. So I pulled out this coat pattern I made for my Paola Reinas back in 2015 (yes, there are SOOO many things on my hard drive that haven’t made it to the blog yet!) and resized it for my new doll, Milena (see below). By the time I was ready to take the pix, most of the snow was melting away, so it did end up looking Spring-y. If you’re wondering, the new-to-the-blog doll is a Natterer/Petitcollin Starlette named Milena. I didn’t have time for comparison pix, but she’s very similar to Sasha with longer legs. 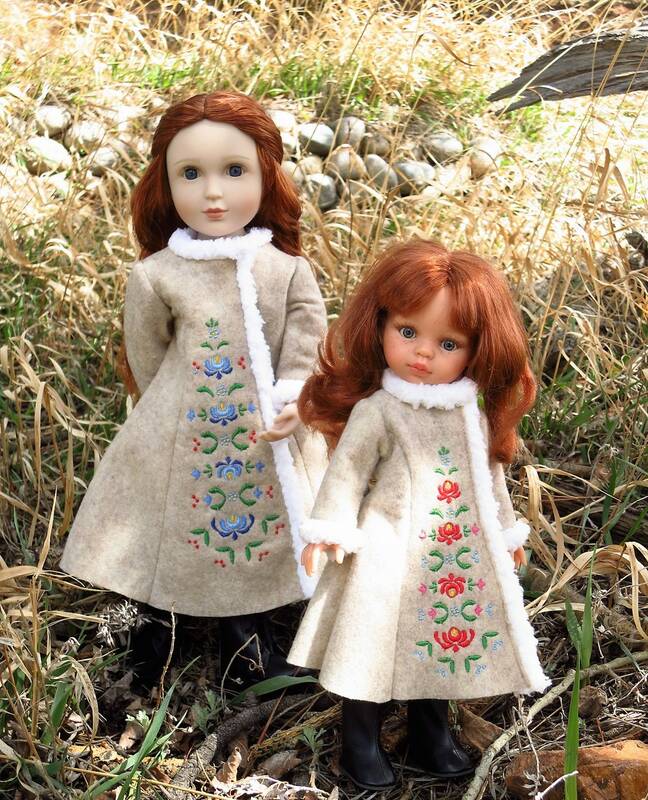 The coat is a great fit on other 16” dolls too, like the lovely AGAT Elinor above. 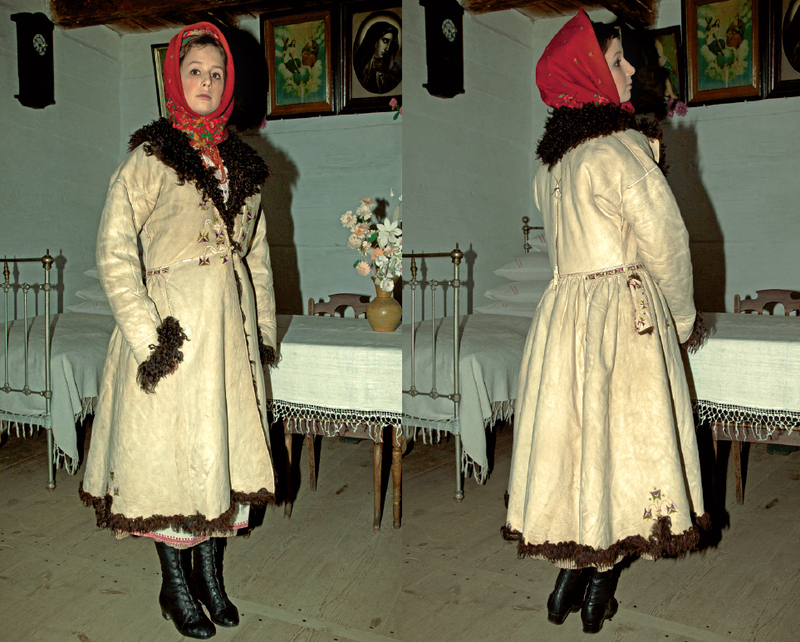 This coat is inspired by sheepskin coats worn in parts of Poland, Russia and the rest of Eastern Europe. I say inspired, but not traditional, because this one has a princess cut rather than the separate skirt and back gathers you can see on close-up pix. Its flowers welcome spring, but the felt and fleece keep your doll warm when “Spring” means “still pretty icy, raw ‘n’ glacial.” 😊 The embroidery design is generically European, but the color scheme is taken from the Polish Haft Kaszubski (Kashubian embroidery). If you’re a fast seamstress, you could use pastel colors to make a really cute Easter coat to tuck into that special basket this weekend! 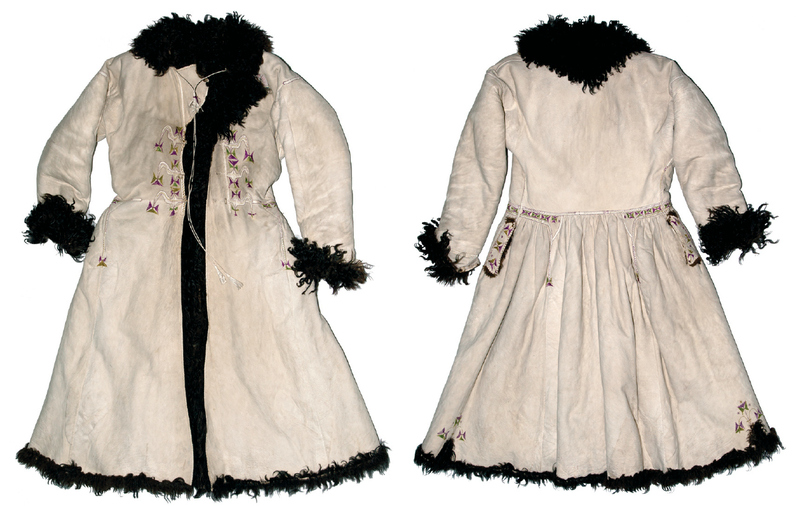 Shortened, it makes a great 1970s or boho-style coat for AG Julie or Sasha! You can easily paint the design or use fabric markers if you don’t have time to embroider. Want the machine embroidery files? They’re here and include a 16″ size that works for 16-18″ dolls and a resized smaller version pictured on Paola Reina for 12-14″ dolls. A new dress for Lilo! I’ll spare you a long story and just say I got some Disney animator dolls, and my favorite among them right now is Lilo. She’s really cute, and like all of them, has an OK price to quality ratio, by which I mean she was inexpensive, but her hair/clothing/accessory quality leave a lot to be desired, especially if you know how to sew and can see where corners were cut during construction. She came in a cute, simple red dress with a leaf print, but the inside was not finished at all. That’s no big deal with a tightly-woven fabric, but this is synthetic and fraying already, and the hems are only turned once. I feel like they could have heat-sealed the fabric at least if they weren’t going to serge it together, but can’t complain too much, since I got the doll on sale for $22. If you’re reading this blog, I’m reasonably sure you know how to sew too, so here is a pattern for you to make your Lilo (or any other animator doll) a better dress! It’s fast and easy, just the thing to help you recover from all those pleats in the summer sew-along! 😊 Leave off the sleeves to make her yellow/green dress from the movie or experiment with the suggested cutting lines to make all kinds of variations. For many kids, having different clothing for their dolls adds a HUGE amount to their play value. I’ve commented before that sometimes props/outfits can spark the imagination, and while it’s perfectly fine for kids to practice structuring a narrative by acting out a movie with their dolls, it’s even better to come up with their own stories/ideas/adventures! Speaking of easy alterations, if you already have the Island sewing pattern set you can copy the AG version of the muumuu at 80% to fit Lilo! Before you go skipping gleefully down to the copy shop with all your AG patterns in hand though, note that their body shapes are different, so it won’t work with everything, especially pants, fitted bodices and possibly sleeves. Also note that the earlier editions of the Animators are smaller in the torso too, so if that’s who you’re using it for, you should close the back with an overlap. More about resizing and what fits them in a future post! If you don’t have the Island pattern set and just want the muumuu pattern by itself, I’ve put it in a separate listing on etsy here which includes the original 14″ (Wellie) and 18″ (AG) and the resized 16″ pieces to make the dress Lilo is wearing in the pic above. To reiterate…this is the same pattern that comes in the Island sewing pattern set with the addition of extra pattern pieces for 16″ dolls. Spring is usually a VERY snowy time in the mountains, but the weather has so far been pretty nice – although much too windy to take doll pix outside unfortunately! This project is perfect if you’re really looking forward to warm weather. It’s not as quick as I initially anticipated, but should be do-able for an advanced beginner, since it’s not much more complicated than making a pair of pants. Try the playsuit part as a swimsuit for Nanea, or maybe even Melody if you shorten the legs. In case it’s not obvious, you could also turn the facing to the inside so it doesn’t show and in that case you could just pink the raw edges and not have to deal with the hassle of turning it under. If your doll is brand new, this playsuit might be loose on her. See inside the pattern for “Are AGs losing weight again?” If you need a tight fit, I would suggest sewing the side seams first and basting the center front seam. Pin the back in place and then take in any excess at the front. For that reason, I changed the front facing piece to have a CF seam, instead of a fold as you see here. Make sure to adjust it the same amount that you take in at the front. 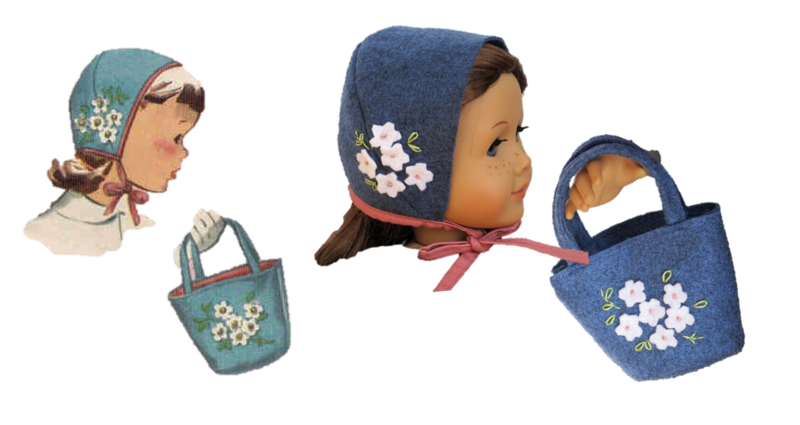 This week, continuing with the vintage Simplicity 1803 we have a sweet little bonnet and bag you can make quickly from felt to match your doll’s winter coat! As I was planning next week’s post, I happened to look at the calendar and realized it’s Pearl Harbor Remembrance Day next Thursday. That just cries out to have something Nanea-related! The final installment of the Christmas projects will be the following week with the stocking and non-sock-doll (more about that later!). Several people have requested a resize of Nanea’s ruffled dress from here for Wellies, so we could do that OR have have a new dress for Nanea. Which would you like? Vote below – poll closes tomorrow! If your kids have hit that summer slump and you’re looking for something fun to craft with them, you’re going to be happy with these projects! The Lottie line (which also now includes 2 boys, Finn and Sammi ) is great as summer doll because they’re small and light, which means they travel well (mine went to Korea!) and being all hard plastic they’re durable enough for the beach/camping/etc. You might recall a few weeks ago I mentioned my Forest Friend Lottie was pretty lacking in the outfit/accessory department compared to the rest of them, so I started making some little stuffed forest friends for her based on the pictures from her packaging. That idea expanded into a versatile little owl who can be used as a sleeping bag or carrying pouch for up to two Lotties at a time, or one Lottie and some felty friends coming next week! This is a great project to do with a child, and the instructions note which parts can be hand sewed and which are best on a machine. If the child has some sewing experience and is patient enough, the whole thing could be done by hand, and an experienced seamstress with lots of wool felt and embroidery floss could turn this into a work of art! If you finished the sew-along and posted all your pix on flickr, congratulations! Your dachshund pattern will be emailed out today. If you need more time to complete all the outfits, please see last week’s post for info on how to do that! You’re surely aware of AG’s newest modern doll, “Z”. We went to the AG store the weekend she launched, but I couldn’t bring myself to get her when the only difference between her and “the doll formerly known as Violet” was a beauty mark and slightly longer hair. A big surprise was that they were selling Z’s sparkly shoes separately, so I snapped those up and also got her camera equipment. The plan was to also get her book, read it, and use “the doll formerly known as Violet” as “Z”. Can you believe the books were sold out? Maybe others had the same idea… So anyway, I read the beginning of it on amazon and decided…meh, not worth $10, I’d rather invent my own story, although I like the outfits/accessories they came up with for Z and decided to do something similar for my doll. This post was originally going to appear with one pattern a day, but the thought of doing a post every day and breaking all of this up into multiple pdfs seemed like it might be annoying to link back to find things later, so here is one MEGA post with an entire mix/match wardrobe. As you’ll see in the pix, it makes a perfect capsule/travel wardrobe and should be more than enough to keep you busy all week! Enjoy!